The Flying Pirate Half Marathon course winds its way through the natural beauty that is North Carolina’s Outer Banks. Run the 13.1 miles and cover some spectacular ground. 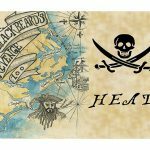 Come to the Outer Banks and join the Pirates for this fantastic race! Begin in Kitty Hawk and follow the course into Nags Head, along with the Albemarle Sound, around the Wright Brothers National Memorial, and through the Nags Head Woods Maritime Forest. Finish with a Pirate Jamboree in Nags Head! On Saturday run the First Flight 5K on the NPS grounds of the Wright Brothers Memorial! Fun for everyone includes Finisher medals, event shirts, SWAG & Pirate Jamboree on Sunday! Come fly with the Pirates!